Dimensions 0.25 by 7.75 by 9.25 in. Amazon.com description: Product Description: Focus on the information most important in preparing for the HR certification exam with a blend of practical HR concepts and proven HR practices found in HUMAN RESOURCE MANAGEMENT: ESSENTIAL PERSPECTIVES, 5E. To further your professional success, this concise essentials text by leading HR authors Robert Mathis and John Jackson reviews today's most important laws and regulations and addresses the information most often used by human resource professionals. Easy to use and economical, the book introduces HR concepts and practices in a format that's applicable for practicing HR professionals in virtually all industries. New chapter openers place concepts in a strong managerial context, making it easy to understand the importance and impact of the principles you are learning. Timely Internet resources and additional readings offer clear guidelines for further HR study in the areas that interest you. Discover the best in human resource management in HUMAN RESOURCE MANAGEMENT: ESSENTIAL PERSPECTIVES, 5E. About: Focus on the information most important in preparing for the HR certification exam with a blend of practical HR concepts and proven HR practices found in HUMAN RESOURCE MANAGEMENT: ESSENTIAL PERSPECTIVES, 6th Edition. About: Focus on the information most important in preparing for the HR certification exam with a blend of practical HR concepts and proven HR practices found in HUMAN RESOURCE MANAGEMENT: ESSENTIAL PERSPECTIVES, 5E. About: HUMAN RESOURCE MANAGEMENT: ESSENTIAL PERSPECTIVES is the perfect guide for anyone preparing for the HR certification exam. 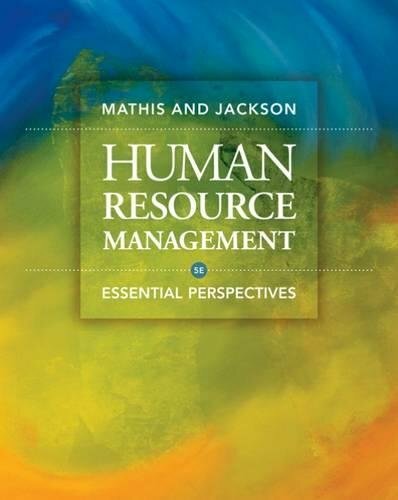 About: Human Resource Management: Essential Perspectives, 3e offers practical coverage of basic HR concepts and practices, including the review of important laws and regulations as well as an overview of information that is commonly used by human resource professionals. About: This new edition lets you navigate quickly through an intelligently condensed series of issues that allows you to focus on the most important principles of a challenging field of study. About: The first in a proposed series of titles on human resource issues published under a newly formed alliance between South-Western College Publishing and the Society for Human Resource Management (SHRM).